Cottage by the Sea! July Fourth still open, full week rental. Perched on a rise overlooking the sea, the rustic cottage is a stone's throw from the rocky shore. Ledgemere is located in one of the most beautiful coastal areas of Maine. Plenty of parking, good running water, easily accessible to everything in mid-coast Maine. Five Islands (Georgetown) is about an hour north of Portland, 20 minutes from Bath, Maine. This quaint lobstering community still holds the charm of an era gone by. A true getaway, we invite you to experience all that Five Islands has to offer. The cottage is very warm at night and during inclement weather. There is plenty of parking, and it is easily accessible. Kids and dogs just love this place as they can explore all over the woods or be at the beach in seconds and explore for sea treasures and take a quick dip. It is the perfect place if you are launching a kayak or a quickly and easily. Located at the mouth of Sheepscott River and the Atlantic Ocean, this rustic cottage sits just off the rugged coastline. It is a 'memory box' to the many families that have visited over the past 150 years. It is a bird watchers paradise and a fisherman's dream, where children can frolic on a mile long coastline or dip in a fresh water pond! If your mouth is longing for a tasty clam basket or lobster just pulled out of the icy waters, Five Islands is the home of the "Big Boys" and Five Islands Lobster Company! Mid-coast Maine is home to wonderful artists and craftsman including the Wyeths, Pucci, and Zoracks. The cottage is a 'Merry Meeting Place' where it is okay to have a little sand between your toes. It is comfortable, welcoming and has everything one needs without modern day distractions. Feel like shopping? Freeport, the home of L.L. Bean is just a 30 minute drive; Boothbay Harbor is across the bay where you can jump on a boat and see whales, dolphins and seals; Reid State Park is 10 minutes on the other side of the island and fantastic eateries abound in the area! We welcome you to Ledgemere, the cottage by the sea where you can breathe the fresh Maine air! Our family has been making the pilgrimage to Five Islands for over one hundred and fifty years. We consider it a gift from God. We are happy to have the opportunity to share it with others. Once you visit Five Islands, you too may be making the annual pilgrimage. The cottage is on Ledgemere Road which is the last road that you pass before you come to the end of 127 and run onto the wharf. It is perfectly situated to access everything in Five Islands. It is easy to get to and there is plenty of parking. The water is good and plentiful. Water access to launch a boat or kayak is every where one looks. It is warm and cozy with everything that a family would need in any type of Maine weather or season. The unique benefit of Ledgemere is that it brings all who visit, peace. toilet, combination tub/shower, outdoor shower, Bathtub and shower. An additional shower outside. Ledgemere sets on a ridge overlooking the Atlantic Ocean and the Sheepscot River; there is water all around. One can see some of the water from the cottage and across the bay to Southport Island. Only for weather and news. There is a tennis court on the island. Swimming and water sports are abundant on Georgetown Island, Maine. There are two large ponds on the island where there is communal swimming, kayaking or canoeing. The ocean surrounds the island and one can jump in anywhere with a little beach about two minutes from the cottage and then a mile and a half long beach on the other side of the island. Actually, the long beach on the other side of the island is called Reid's State Park and it has picnic areas, swimming (surf and lagoon), river running, or even clam digging. There are boat ramps so that one can drop a boat in easily and take off from Georgetown to head out for a miraculous day of boating. You are going to love this area of mid-coast Maine. We were a group of friends who were kayaking in the area. The house was perfect! Heidi promptly answered all our questions. We had a great time. Thank you Heidi! Stepping back in time with all the modern day conveniences. Loved having breakfast in the early morning sun on the deck with glimpses of the cove and boats passing by. So quiet and peaceful. And so very many interesting things to explore. Really hope to make it back again. Thank you for sharing your little piece of heaven. Love this cottage with all its charm. Huge deck and enjoyed the enclosed porch in the evening. So many interesting items & art to enjoy. Short walk to the water. Enjoyed the cottage and area very much. Five Islands is a special place on the Maine coast. Easy access the the Nature Concervancy’s shoreline; great outdoor shower; and a fascinating collection of a family’s memorabilia. My friend and her two kids felt right at home and had a lovely stay. 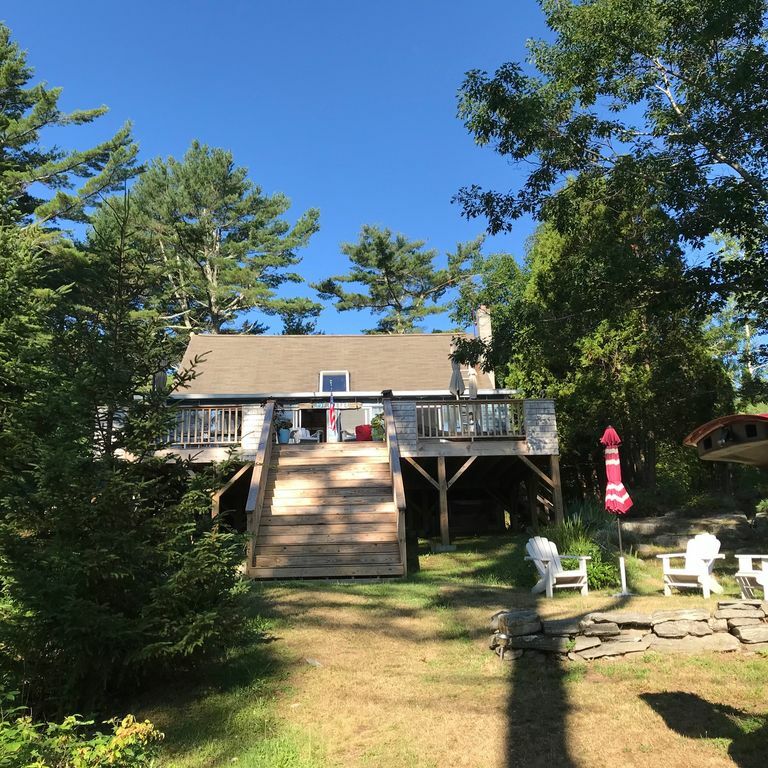 Charming cottage to enjoy Five Islands, brought back a lot of good Maine memories. Kids had a great time, just a few mins walk to the beach and pier. Neighbors were very welcoming and had a great time over 4th of July. Would definitely stay here again. La maison est tres chaleureuse, la decoration de bon gout et la cuisine bien équipée. Heidi est facile à joindre, la maison est propre et le site de Five Island est grandiose. Je recommande! The cottage is located such that beaching, hiking, and boating is ideal. Deciding where to beach, hike, or go boating are the BIG decisions of the day. Five Islands is located at the mouth of the Sheepscot River and the Atlantic Ocean, so you literally can launch your boat from anywhere and take off for the day. There are so many exciting things to do, so you can drop your anchor or tie up and picnic on an island, go bird watching, go clam digging, watch local artists, eat lobster, or take in a garden tour. Rental rate is 1200. per week, Friday - Friday with check in a 2 pm and checkout at 10:00 am, however, the rental rate per day is 160.00 during the week and 200.00 on the weekends. Weekend rates do apply, which are 600.00 for check in on Friday at 2:00 pm through check out on Monday at 10:00 am. Any additional information that a traveler might need to know is either in the lease agreement or can be worked out with the property owner or property manager.